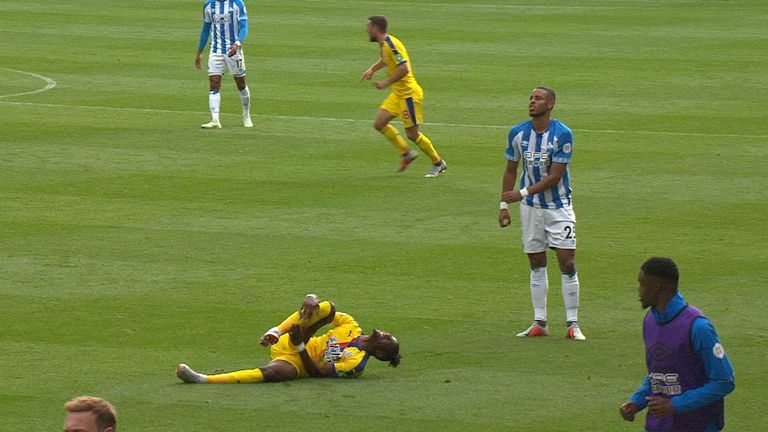 How bad was the 'red card' foul on Wilfried Zaha? Did Sadio Mane foul Heung-Min Son? Should Harry Maguire have been sent off? Former Premier League referee Dermot Gallagher has the answers. It was a busy weekend for referees across the Premier League, with a number of controversial incidents, and a heartfelt interview from Wilfried Zaha after Crystal Palace's 1-0 win at Huddersfield in which he claimed he would have to "break a leg" before anyone was sent off for fouling him. INCIDENT: Mathias Jorgensen was shown a yellow card for a late challenge on Wilfried Zaha, but after the game Zaha questioned whether he would have to have his leg broken before anyone was sent off. VERDICT: I've seen him receive bad fouls this season, but I don't think it's a particularly bad foul. If anything the defender is unlucky because he doesn't see Zaha coming. He stretches for the ball and Zaha is just too fast for him. Was Zaha right to be aggrieved? He does get fouled but most-fouled lists can be artificial; someone has to be top and bottom. Years ago, Kevin Davies was the most fouled player in the Premier League, but also committed the most fouls. We don't know what those fouls are. He hasn't been booked for simulation this year, I feel a little bit sorry for him. I've said before I don't think he's a diver. INCIDENT: Nemanja Matic was sent off for picking up two yellow cards. The first was given for hauling down Abdoulaye Doucoure as he launched a counter-attack, and the second for a late challenge on Will Hughes. VERDICT: I think this falls into the bracket of asking why you give the referee a decision to make. Why do it? The way the referee did this game, he was consistent throughout, and that was a yellow card in that game. He was 100 per cent consistent from minute one to minute 90. INCIDENT: Marouane Fellaini's arm made contact with Troy Deeney's face as the two competed for an aerial ball going into the Manchester United box. VERDICT: I've looked at this and I cannot see any elbow whatsoever. There's nothing hitting the face, I just can't see it. It's the merest brush of somebody's sleeve. 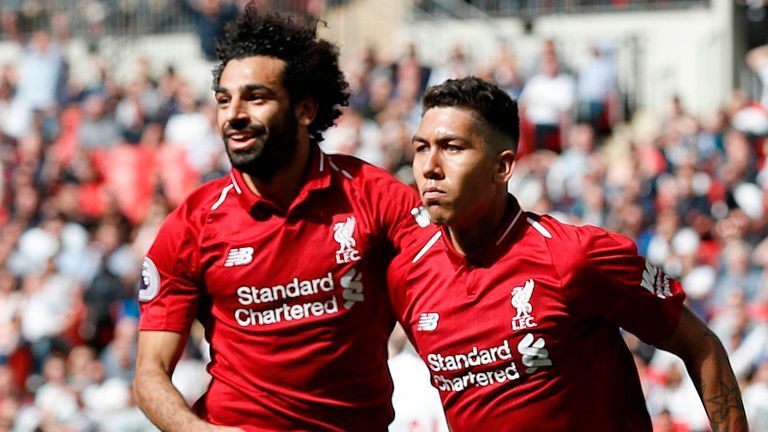 INCIDENT: Giorginio Wijnaldum was awarded a goal when his header from a Liverpool corner crossed the line, despite goalkeeper Michel Vorm's attempts to punch it clear. Referee Michael Oliver gave the goal through goal-line technology. VERDICT: We laughed about this technology when it came in, but you look at the assistant and he couldn't give it when it went in because of his position, which wasn't on the goal-line. I think the decision system is fantastic in the Premier League. INCIDENT: Heung-Min Son appeared to be brought to ground by Sadio Mane inside the Liverpool penalty area in injury-time with Tottenham trailing 2-1, but nothing was given by Oliver. Should Son have been awarded a pen? VERDICT: It is a penalty when you slow it down and look at it. I was watching this game and I thought he kicked his own foot. The TV picked it up and I was astonished when I saw it back, but the referee couldn't give it in real time. INCIDENT: Ricardo Pereira was penalised by Craig Pawson for handling in his own penalty area, after controlling the ball with his knee onto his outstretched arm. A penalty was given, which Bournemouth converted. VERDICT: It's just a misread, or whether Craig was too quick, I don't know. It's not a penalty, though. 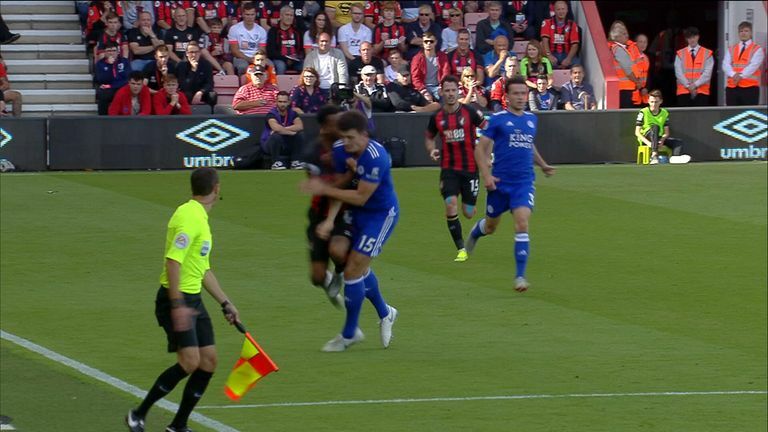 INCIDENT: Harry Maguire, already booked, is not shown a second yellow card when he flies into a challenge with Josh King, clattering the Bournemouth player. Pawson gives a foul. VERDICT: Different referee, different tolerance level. Mike Dean [in the Watford v Man Utd game] was totally consistent, this referee, unfortunately, his tolerance level ebbed and flowed a little bit. Sometimes as referees we make a rod for our own back. INCIDENT: Arthur Masuaku caught Theo Walcott with a boot to the back of the head as the pair competed for an aerial ball. A yellow card was given to the West Ham defender. Zaha, Neymar paying for reputation? Was Masuaku lucky to avoid a sending off? VERDICT: He's unlucky here. He doesn't realise where the player is, I think it's a yellow card. He's a short distance away, his boot goes up, and I think it looks bad because his boot connects with his back. If he doesn't hold it there, his boot has to come down and I think where he's clever, he doesn't go down or rake him down. So I think the referee was quite right there. The weekend isn't finished yet though - catch Southampton v Brighton live on Sky Sports Premier League with Monday Night Football from 7pm on Monday night.